If you take pride in keeping your motor vehicle looking its best, it can be extremely frustrating when you have to deal with tasks that are too difficult for conventional detergents and elbow grease. For a heavy duty cleaning and restoration projects, there is a fantastically efficient alternative: sandblasting in New Jersey. At J&R Sandblasting, our professionals have been helping local residents and businesses with all their heavy duty car part cleaning needs since 2001. We have a large blasting bay that can house a full-sized dump truck. We also have a rotisserie system that can give us access to every part of your car’s frame. 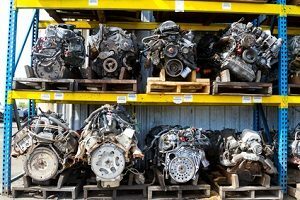 Call J&R Sandblasting today if you need to hire a professional sandblasting company to help clean your motor vehicle parts in New Jersey. Our polite staff is here to assist you in any way that we can. Our knowledgeable experts can answer any questions that you may have about cleaning car parts with sandblasting. We can schedule your appointment today. Sandblasting, also knowing as abrasive media blasting, is a method that can be used to clean all types of surfaces including metal, plastic, wood, and masonry. Although there are different types, they all work in the same fashion. A high pressure jet of air and particulate is blasted at the surface to be treated. At J&R Sandblasting, our professionals specialize in both traditional sandblasting and sodablasting techniques. Depending on the car part we are cleaning and the specific type of corrosion being lifted, we will utilize different abrasive media (glass, walnut shells, plastic, or baking soda) and different pressure levels. In this way, we can expertly clean your car part while protecting and preserving its integrity. You are guaranteed to be completely satisfied with the results of our sandblasting in New Jersey. Your current vehicle or restoration project will look its absolute best after we get done with it. The hardest part of any major motorcycle or car restoration project is cleaning away years of grime, rust, and paint from the vehicle’s body work. Trying to do this with traditional methods is extremely arduous, tedious, and frustrating. If you hire our New Jersey sandblasting company for the task, this portion of the project immediately becomes the easy aspect of your effort. In a matter of minutes, our professionals can rid your car or bike of all of these frustrating surface contaminants. We specialize in cleaning car parts and antique car frame restoration utilizing our customized sandblasting services. After our effort, each part will be exquisitely cleaned and will be ready for any paint or primer application. If you need to hire a professional to clean car parts using sandblasting in New Jersey, call J&R Sandblasting today at 201-832-0995, or fill out our online request form.